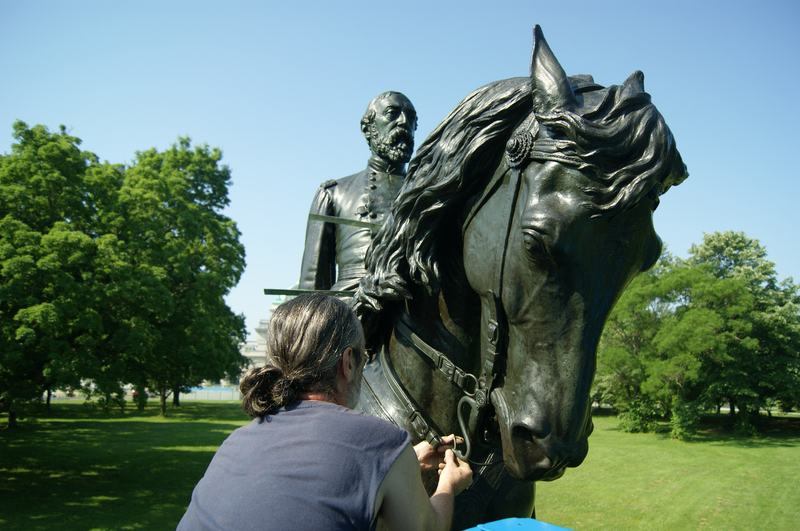 On Thursday, May 30, 2013, a conservation team completed special restoration treatment to the Civil War sculpture of Major General George Gordon Meade (1887) by Alexander Milne Calder. The sculpture received a surface cleaning, a protective wax coating, and was buffed to bring out the artwork’s highlights. Unique to this restoration was the installation of several re-fabricated elements, including the reins for Meade’s horse, “Baldy.” Located on Lansdowne Drive just north of Memorial Hall in West Fairmount Park, General Meade has been part of the Association for Public Art’s Conservation Maintenance Program since 1983. Work this year was funded by an anonymous donor in honor of the 150th Anniversary of the Battle of Gettysburg. A conservator installs newly fabricated reins for Meade’s horse “Baldy” as part of the sculpture’s special restoration treatment. The victorious general of the Battle of Gettysburg, Major General Meade was the Army of the Potomac Commander during the Civil War. Meade was also an engineer and an early park commissioner who helped design portions of Fairmount Park. The General and his horse “Baldy” gaze out across the park landscape in the direction of Laurel Hill Cemetery where Meade was buried. This is the first large-scale bronze by famed artist Alexander Milne Calder, sculptor of William Penn and numerous other sculptures adorning Philadelphia’s City Hall. In 1887, over thirty thousand people watched Meade’s grandsons unveil this statue, which was the the first major commission project of the Fairmount Park Art Association (now the Association for Public Art). Laurel Hill Cemetery was founded in 1836 as a nonsectarian alternative to Philadelphia’s crowded, inner-city churchyards of the early nineteenth century.